Faculty and students in the division of social sciences show how the farm plays a crucial role in their research at farm and garden’s recent First Fifty Celebration. 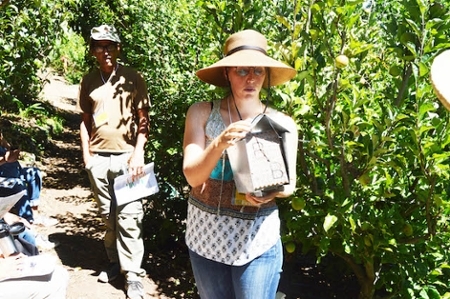 Environmental Studies professor and former director of CASFS Carol Shennan led a tour of research sites at the farm as part of the Farm and Garden’s 50th anniversary weekend. Shennan talks to guests about her research with Joji Muramoto on anaerobic soil disinfestation (ASD), a biological process that can control soil born diseases in strawberries. Photos by Melissa De Witte. One of the stops on Shennan’s tour of the farm was its blueberry production site. “There were no blueberries grown on the Central Coast back then, let alone organic ones.” reflects Shennan. “We were the first to test what varietals would perform best under central coast growing conditions,” she says about the 2004 trial set up by then farm manager Jim Leap. Now, blueberries are thriving at the farm, coveted by its CSA members and community members alike. They also offer a profitable “niche crop” for small-scale growers. “If we didn’t have this facility, we’d be in a really difficult situation,” said Environmental Studies professor Carol Shennan about the 30-acre organic farm managed by UC Santa Cruz’s Center for Agroecology and Sustainable Food Systems (CASFS). 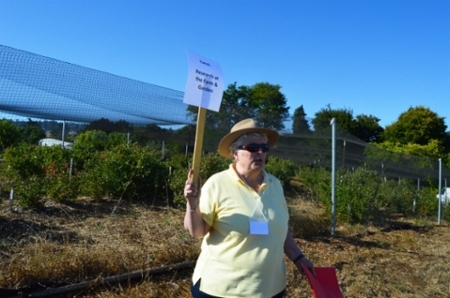 “We are not going to ask a farmer to try an experiment first,” Shennan said on a tour she led of research sites at the UCSC Farm and Garden's 50th anniversary weekend, held Jul 28-30, 2017. Shennan joined CASFS in 1997, where she served as its director until 2006. Under Shennan’s stewardship the campus’ experiment in organic farming took on new research projects to address some of the biggest challenges facing organic farmers. Shennan worked closely with former U.S. Rep. Sam Farr (D-Carmel), the US Department of Agriculture (USDA), and the California Strawberry Commission to secure a series of grants to study alternative farming methods, including alternatives to fumigation and soil-borne pest management in strawberries..
Strawberries are one of the most critical crops to Central Coast growers and other farmers in California. 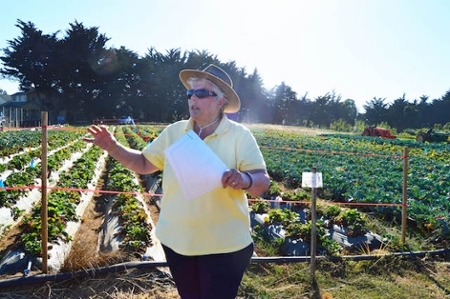 Organic strawberries are a featured crop at the UC Santa Cruz farm. Since 1987, CASFS has been experimenting with different ways to grow organic berries while controlling pests and soil-borne diseases. The latest technique being trialed is a method Shennan is studying with UCSC researcher Joji Muramoto: anaerobic soil disinfestation (ASD). ASD temporarily makes soil anaerobic (free of oxygen) by integrating a carbon source such as rice bran or molasses into the topsoil and soaking the soil with water. Then, the soil surface is covered with plastic film to prevent any resupply of oxygen and left for several weeks to ferment. Unlike fumigation, ASD is a biological process that requires the right conditions to control disease. “ASD works best in conjunction with other disease management approaches like crop rotation that can help prevent disease levels from getting very high,” said Shennan, who is in year six of an innovative crop rotation trial to test different variables impacting strawberry growth. Shennan is looking at things like what crop works best in rotation with strawberries (e.g. lettuce or broccoli?) and what carbon source works better (e.g. mustard cake or rice bran?) to control different soil-borne pathogens. But as Shennan pointed out, each pathogen is different with many environmental factors to consider. When Shennan and Muramoto started the experiment, no one in the area was using this technique. Now it is blossoming into a new industry, with a local company providing the technical assistance needed for this method. The ASD trial is not the only research project based at the CASFS facilities. Stacy Philpott (middle), joined by graduate student and former CASFS apprentice Hamutahl Cohen (right), led a workshop about bee pollination - a vital part of many plant or crop’s fertilization process. Insect hotel or pollinator palace? 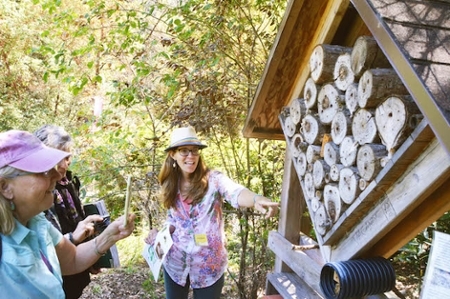 Philpott points out a bee checking in to the insect hotel, built by Cohen and a team of environmental studies graduate and undergraduate students. It was a community effort, with Cohen’s father helping. Hamutal Cohen completed the CASFS Farm & Garden Apprenticeship in Ecological Horticulture in 2012. Now she is earning her Ph.D. in environmental studies at UCSC. Here, Cohen discusses the benefits of keeping mason bees. Stacy Philpott, associate professor in environmental studies and holder of the Ruth and Alfred Heller Chair in Agroecology, has been exploring ecological sustainability within agricultural systems in urban gardens. One of Philpott’s sites is the Alan Chadwick Garden, established in 1967 on a 3-acre hillside adjacent to Stevenson and Merrill Colleges. As part of the 50th anniversary celebration, Philpott, joined by graduate student and former CASFS apprentice Hamutahl Cohen, led a workshop about bee pollination - a vital part of many plant or crop’s fertilization process. Across the country, honeybee populations are in decline. Mites, pathogens and parasites, invasive species, pesticides, migratory beekeeping, and habitat loss are some of the many factors contributing to bee decline, Philpott shared. As part of her research on bee diversity on the Central Coast, Philpott is looking at what habitat bees are attracted to and is identifying practical ways for gardeners and farmers alike to create spaces that enhance the role of wild pollinators. “Ecology is really complicated,” Philpott also warned. While one could create a space that will make bees happy, it could come at the cost of making other important insects unhappy. “Having bare ground is incredibly important for bee nesting,” said Philpott. When gardeners lay down mulch and woodchips, it makes it hard for bees to excavate their nests, explained Philpott. But mulch is beneficial for other insects, like ladybugs. So Philpott recommends gardeners do a mix. Philpott and Cohen shared ways that gardeners can promote nesting, including creating artificial nests known as insect hotels. Artificial bee nests offer shelter for bees, which can only travel short distances from their nests to collect pollen, and in the process, pollinate crops. Whether it is a bee or a berry, Philpott, Shennan, and Cohen all emphasized how important it is to examine the whole environment. What works in one place might not work in another. To understand a growth or decline of a species, the larger schema they are situated in needs to be understood. 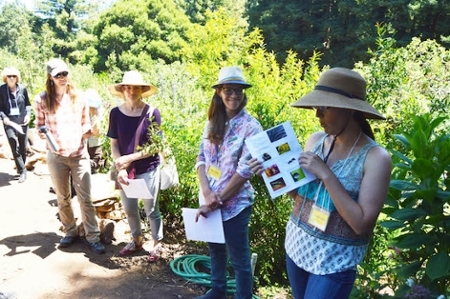 For 50 years, the UCSC Farm and Alan Chadwick Garden have offered critical sites for exploring these questions.